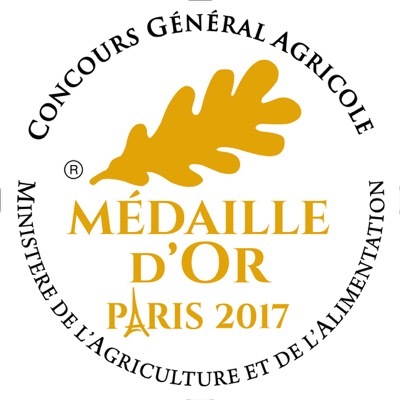 Winners of 4 medals at the salon de l’agriculture this year, 2017, including a gold medal for their Bière Brun au Maury..
Whilst the Roussillon area is without doubt renowned for its wines, and one of the top producing areas in the whole of Europe, beer has never been very high on the list of priorities of either producers or consumers here. 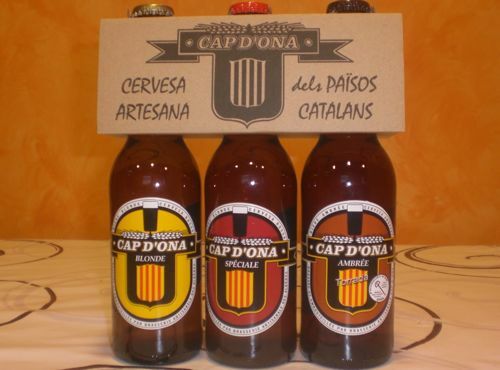 However, with microbreweries making a strong comeback all over the world, led particularly by Belgium, Holland, The UK and USA ,it is very pleasing to see the emergence of the Cap d’Ona brewery in Argelès. Started in 1999 by the Engler family, who have a brewing tradition stretching back hundreds of years in Eastern France, they operate out of purpose built premises in the ZA near Carrefour in the seaside town. Although the brewery is state of the art, the methods used are strictly traditional, with only quality ingrédients used ; malt,wheat, rye,yeast,and,of course, pure well water. The process differs slightly for each beer, but, in the main, cool, top fermentation ensures a distinctive character and satisfying flavour. Flavoured with Rosemary,this is a light ,slightly cloudy wheat beer, perfect for hot summer days. This is a pils type beer. Very refreshing and made with 100% certified organic ingrédients. This light ale has a little Albères honey added after fermentation, giving it a pleasantly sweet finish. A fascinating attempt at marrying their own product with another famous Roussillon beverage, this light beer is fortfied with 8% Muscat de Rivesaltes,leaving a fruity aroma. Similar to the above,but with the addition of Banyuls wine rather than the Muscat. Cap d’Ona are justifiably proud of this bitter ale,made from 100% malted barley,as it has recently won a gold medal in a Concours of French microbreweries. 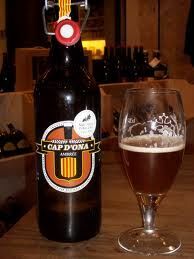 In addition,this year Cap d’Ona are producing not one, but two Christmas beers; an ambrée at 7.5% and a blonde at 8%. For teetotallers/drivers,it is worth noting that a cola called Alter and a traditional low sugar lemonade are also produced. The increased popularity of artisan beers has meant that the brewery’s products are becoming quite widely available, not just in small specialist shops, but even in the Grands Surfaces such as Auchan and Carrefour. Both 33 and 75 cl bottles are available. A growing number of bars,cafés and restaurants, particularly on the coastal strip,Vallespir and Perpignan also stock at least 2 of the range, even on draught in a few places! They also serve very respectable tapas style meals.